I just wanted to say a huge thank you to my little band of loyal followers and those who comment so regularly! I have been blown away by this whole experience and continue to be on a daily basis! I have to admit that it’s all been a bit like Narnia for me! An incredible world that was under my nose the whole time (but with less lions, witches and wardrobes)!! So waffle over we begin a new challenge over at the Cutie Pie Challenge Blog today and our theme this fortnight is Father’s Day! 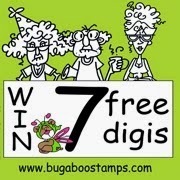 This time we are sponsored by the fabby Bugaboo Stamps with this amazing prize on offer to one lucky winner! I love this little cowboy (available here) and have to admit to singing ‘Home on the Range’ almost constantly whilst making this card. Be grateful you were not in earshot!! My poor dogs!! This was one of my ‘evolving’ creations that just sort of grew and grew! I knew I wanted to do a stepper card and shrink the digi to use as part of a ‘Wanted’ poster and it just escalated from there really! Pop over to the Cutie Pies blog to see the amazing inspiration created by my teamies and play along. Oh and please, please, please don’t forget to make your creation CUTE! Yee ha and see ya! Super card Jane, love the bugaboo images too. I have candy on my blog if you are interested.. Your card is absolutely amazing! LOVE all those details. That wanted poster is absolutely GORGEOUS! Stunning rich colour Jane and your fabulous detail. Love this, love them all. Congratulations on your Blogaversary. Awesome card for a dad. My dad would love this one. Thanks for joining us this week for "Father's Day." Good Luck, and come back to join us again. What a fab design, Jane - I love it. Thanx for playing along at Cardz 4 Guyz and good luck. Wow your card is absolutely fantastic, it's wonderful. Thank you for sharing it with us at Fab 'n' Funky Challenges. I love it, Jane! Your layering is so good and love how you used all of the elements! I gotta have that guy now! Thanks, Sam! I didn't use pencils but the chisel end of my markers! What a mess I made of my glass mat!! Fabulous card Jane, I love this image too, and also made a birthday card for my grandson a couple of years ago with it.. your designs are always so amazing and such a pleasure to look at!! Happy 1 year Blog Anniversary Jane! Time flies doesn't it?! Well, your card is just absolutely GOR-GEOUS! Love this design, and you've put it together so BEAUTIFULLY! Such a wonderfully designed card, love the cute cowboy and your wanted poster and all the other fab embellies. Thanks for sharing with us at Aud Sentiments this fortnight.